Chandelier Parts, Chandelier Accessories and Chandelier Spares, Replacement Chandelier Parts, chandelier ceiling rose, chandelier installation, brass ceiling rose, brass lighting components, chandelier restoration, chandelier parts and accessories. Kings Chandelier Services Ltd, in addition to undertaking chandelier repairs, renovation and antique chandelier restoration using our extensive stock of crystal and glass, provide the trade and general public with chandelier parts and lighting accessories at extremely reasonable prices. Our stock consists of chandelier arms, stem glass and chandelier crystal, many varieties of bobeche; crystal and glass, many varieties of pendalogs and chandelier buttons in crystal and glass, pins and original 1930’s candle tubes in white, cream and pearl, and brass work. In addition to the antique and original chandelier parts King’s Chandelier Services Ltd now stocks new chandelier crystal and chandelier glass including chandelier arms, chandelier bobeche, chandelier drops and chandelier pendants. For those glass parts that we cannot match it may be able to be blown by our own glass blowers. Our lighting components include lampholders in various finishes including brass, chrome and nickel, dimmers, light fittings, pendants and pull switches and chandelier electric braided cable. We have now also introduced product ranges for the American market including electric cables and lampholders suitable for the USA. We pride ourselves on our stock of genuine antiquechandelier parts, keeping your chandeliers and lighting as authentic as possible. Please click on the relevant categories below to view our extensive range of chandelier parts, chandelier spares and lighting accessories add your required items to our online shopping basket to place your order. If you are unsure of the part you require please click here to load our online order/enquiry form to send us any information you have (including pictures) and we will endeavour to help you find the required parts. 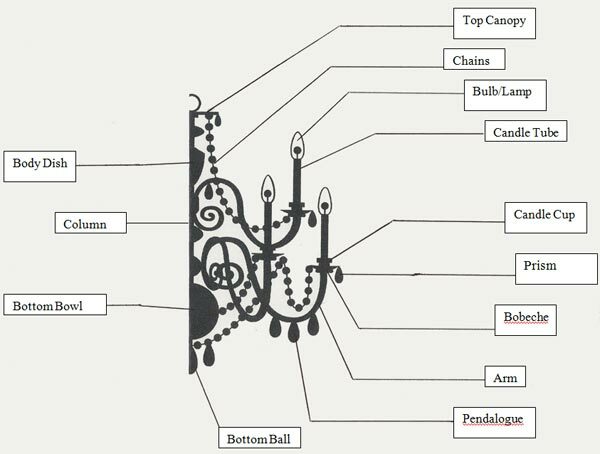 Alternatively, click the button below and view a sketch of a chandelier to find the names of the various chandelier parts.